The Sheffield Tap has been one of the great success stories of the past 12 months. It is salutary proof, despite the dismaying and staggering rate at which British pubs continue to close down, that an expertly conceived and managed new boozer can still do great business. Emboldened by their triumph, the folks responsible have now sought to repeat it in London, and the Euston Tap welcomed in the world one month ago. This afternoon I have an hour or two to pass in central London with Marianthi, my good friend and infallible guide to the pubs and transport network of the capital city. It’s exactly a year since the Sheffield Tap opened (and I wrote the piece about it that kick-started Get to the pub.com). Not to visit the Euston Tap, in the circumstances, would border on the perverse. 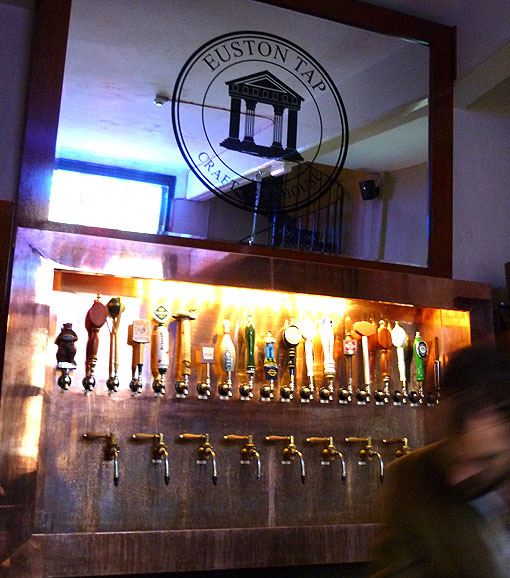 Like its older brother in South Yorkshire, the Euston Tap has made new use of an existing disused building. In Sheffield it was a former refreshment room at the city’s railway station. 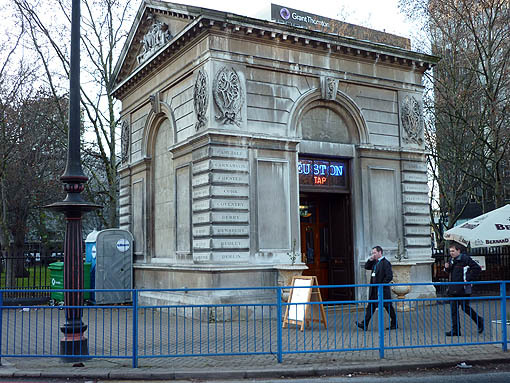 In London it’s one of the two ‘lodges’ just in front of Euston station, built in 1870 to process small parcels carried by the railway and handle enquiries from passengers. For all the historic interest of the building, the Euston Tap’s interior is mostly functional rather than fascinating. The one really attractive feature of the decor is a lovely iron spiral staircase linking two otherwise fairly featureless rooms. Indeed, the upper floor is really quite a dingy affair, with only a small window in the roof admitting any natural light. With no opportunity to add more windows, there’s the down side of reusing a grade II listed building. But what first strikes you about the Euston Tap, above all else, are its tiny dimensions. With nearly 20 cask ales and ‘craft beers’ on tap, and dozens of things in bottles from all over the place, one is tempted to ascribe to the cellar qualities of cosmic spatial distortion that could only be described as Tardis-like. Never in the field of beer and pub writing have so many words been devoted to so small a space. Next you notice that the draught beer is dispensed from an array of pumps and taps positioned against the back wall rather than along the bar. These include both cask and keg beer, which has rather challenged the the old-school Camra orthodoxy that a drink not stored in wooden barrels is necessarily the infernal work of Beelzebub. Double Diamond it ain’t. But there’s nothing more unsettling for the purist than being uncertain whether or not they’re allowed to like something. My avoidance of the new keg beers is based more on pragmatism than dogma: I had a pint in Sheffield a few weeks ago and it cost £3.50. The Euston Tap has a lot of those American ‘craft beers’ that are said to have inspired the new generation of pale ales in this country. And they’re more expensive still. But one day I’ll get round to trying them. One day when I’ve got a lot more money and don’t feel a tremor in my knees at the thought of paying north of three quid for half a pint. So the size of the building and the range of beer are the two features that will immediately be noticed by most visitors to the Euston Tap. My very first impression, however, is the professionalism of the barman in managing not to laugh at me for having struggled to pull the door open. Embarrassment turns quickly to intrigue as I hear my name being spoken by the only other drinker already here. For a moment I wonder whether I’ve been recognised by a member of the beer and pub blogging community. Then I remember that there isn’t a single member of the beer and pub blogging community who has the remotest clue who I am. Instead it’s Mr Carsmile Steve, who I met back in July when he and my friend MJ Hibbett performed their fabulous two-man acoustic rock opera Dinosaur Planet up in Sheffield. Steve is here to meet Mark before the two of them catch a train to Manchester to perform the show there tonight. What are the chances of that? Well, given the amount of effort Steve and Mark put into touring with this show, and the amount of time I spend in pubs, sitting on trains, or in pubs that sit on train stations, the chances of that are probably quite high, actually. Beer, anyone? Steve recommends Edge, a mild dark brown ale from those modest, publicity-shy folks at Brewdog. There’s a long day ahead and at only 3.2%, as Steve puts it, Edge is “a good breakfast beer”. For such a light sup it bursts with flavour, full of moreish and mouthwatering malty goodness. After that we go for Dobber, from the consistently brilliant Marble brewery of Manchester. Gorgeously golden in colour, it pops and tickles and sparkles coquettishly on the palette. These are two stunningly good ales, very different in style, but both beautifully conditioned and served, with way more verve and vim than one often finds in the flat pints of London. 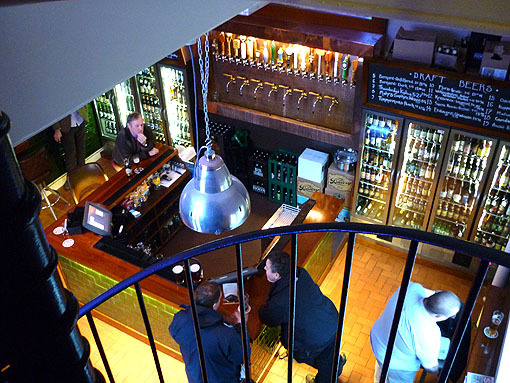 Another pub I visited last December was the Brewery Tap of the Leeds Brewery. A steel-clad ‘modern’ city bar full of post-work, pre-Christmas revellers, it’d been touted by some as a cutting-edge venue attracting a new generation of drinkers to cask beer. I found it a little unsatisfying and short on character, despite the good business it was doing. A year down the line, it now seems that the ‘world beer free house’ model, as seen at the Euston Tap and its Sheffield counterpart, will be leading the way. They’re offering up the very best beers they can find in a broad range of styles, from Britain, Europe and the USA, and they’re doing it in places that are stylish and modern without being soulless. Marianthi and I see out the afternoon in the upstairs room, watching people drift in, delighted by their pints. The Euston Tap may be a place where beer enthusiasts and bloggers – and, indeed, two-man acoustic rock operas – can sometimes cherish the serendipity of the chance meeting. But the lack of space is going to make it uncomfortable at times, and if ale-loving boys and girls are meeting up for a night out around these parts, they might move on to the Bree Louise in the hope of a seat. Apparently it’s been enormously crowded of an evening here already. Then again, so has its predecessor up in Sheffield – and this is a glowing testament to the thing that both of these places do best of all. Today the Euston Tap has given me the best beer I’ve ever had in London by a long way. Good review – and your photos are better than mine. I like the addition of the portaloo to the outside of the pub in the top picture – effectively doubling the toilet capacity of the Euston Tap. The punters at the bar look a bit miserable though in picture 4. I visited just the day before you. Twice in one day, as it turned out. My friend G and I wondered if the upstairs wasn’t actually finished yet? Rough walls and a couple of bare wires made us wonder if panelling or more green metro tiles were still to come. Agreed the beer was of a high standard. It is fairly pricey, but you do get beers seldom seen in London. My only real gripe is that the place is often freezing cold.